Show how to rescue a person touching a live wire in the home. Show how to render first aid to a person who is unconscious from electrical shock. Show how to treat an electrical burn. 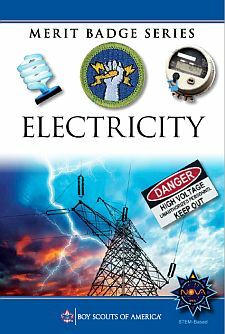 Complete an electrical home safety inspection of your home, using the checklist found in this pamphlet or one approved by your counselor. Discuss what you find with your counselor. Make a simple electromagnet and use it to show magnetic attraction and repulsion. Make a simple drawing to show how a battery and an electric bell work. Explain why a fuse blows or a circuit breaker trips. Tell how to find a blown fuse or tripped circuit breaker in your home. Show how to safely reset the circuit breaker. Make a floor plan wiring diagram of the lights, switches, and outlets for a room in your home. Show which fuse or circuit breaker protects each one. Read an electric meter and, using your family's electric bill, determine the energy cost from the meter readings. Connect a buzzer, bell, or light with a battery. Have a key or switch in the line. Make and run a simple electric motor (not from a kit). Build a simple rheostat. Show that it works. Build a single-pole, double-throw switch. Show that it works. Hook a model electric train layout to a house circuit. Tell how it works.